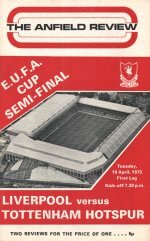 Liverpool qualified for the UEFA Cup by League position having finished third in the First Division in 1971/72. Won on away goals after finishing 2-2 on aggregate. *The first attempt to stage the first leg of the final, on Wednesday May 9th, was abandoned after 27 minutes because of a waterlogged pitch with the score at 0-0 - match void.